Presented by Fowler Automotive and Oklahoma Employees Credit Union. 3:30 p.m. – Gabrielle B. Paint N Cheers - 2pm “Vintage Owls” Class: Saturday Sangria Class | 7pm “Bob Ross” Class: Bob Ross wigs for everyone to wear! Join our Sponsored by YOU campaign to raise $5,000 through crowdsourcing for a new, commissioned public art sculpture in the Plaza District! The sculpture artist, or team of artists, selected by a committee, will debut their plans for the art piece at the 19th annual Plaza District Festival on September 30. ‘Sponsored by YOU’ donations are accepted online at plazadistrictfestival.com. By accepting individual online micro-donations, the Plaza District Association will recognize the community, name by name, as official sponsors of this annual event at the Plaza District Festival. 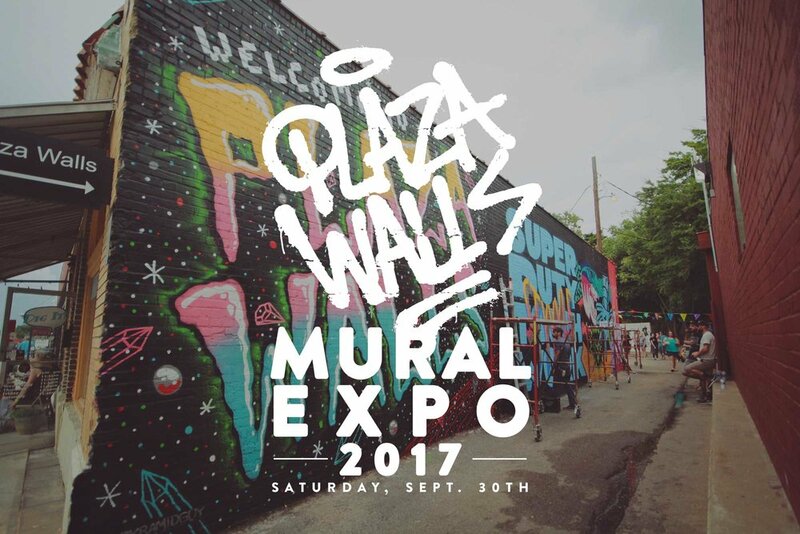 The second annual Plaza Walls Mural Expo will take place during the Plaza District Festival on Saturday, September 30, 2017 from noon - 7 p.m. Created by The Oklahoma Mural Syndicate, a nonprofit whose mission is to advocate and curate public art in Oklahoma, the project has grown to be a top tourist attraction in Oklahoma City. In its second year, Oklahoma Mural Syndicate has partnered with Google as a premier sponsor for the Mural Expo. The 22 spray-paint enthusiasts will begin painting the week of September 25 and will reveal 5,200 square feet of brand new murals on Saturday, September 30. The public is encouraged to walk through the Plaza Walls alley, with entrances on 16th Street and Indiana Avenue. In addition to live painting, the Mural Expo will host The Money Makin' Jam Boys deejaying and the Plaza Walls Mural Expo Artist Booth, which will sell art and exclusive merchandise by participating Mural Expo artists. The confirmed Mural Expo artists are: Jake Beeson, Dylan Bradway, Dustin Caballero, Brady Creative, Wane COD, Ashley Dawn, Rhiana Deck, Denise Duong, Yatika Fields, Chris Foxworth,Tanner Frady, Kris Kanaly, Holey Kids, Jason Pawley, Yeehaw Pizza, Sloke One, Codak Smith, Cassie Stover, Sarah Sully, Tony Thunder, Sean Vali and Aaron Whisner. The Mural Expo will also feature the painting of two large-scale murals. The Saints wall will debut a mural by artist Wane COD. Wane is a prolific graffiti writer and artist from New York City. Across the street, Chris Foxworth will debut his mural on the Everything Goes Dance Wall. Foxworth is a graphic designer and artist living in Kansas City. Both murals will run through January 2018.